One struggle that many of us have when we first start the ketogenic diet is the cravings we have for all of our sugar-filled favorites that we can’t eat anymore. When it comes to breakfast, one of the most widely missed sugar-filled foods is pancakes. With their fluffy, cakey texture accompanied by melted butter and sweet maple syrup, it is hard not love pancakes — but they are so unhealthy. The processed sugar and white flour that are typically used to make pancakes are a nightmare for your health. However, not all pancakes have to be made in the same way. In fact, it is possible to make pancakes that are delicious, healthy, and low-carb — and you can make them just as easily as traditional breakfast pancakes. All you have to do is pick your favorite low-carb keto-friendly pancake recipe from below, and try it out for yourself. Below, you’ll find a list of each individual pancakes and some information behind the health benefits of the recipe. Not only do these pancakes look like the real thing, but they also taste like the real thing as well. No sugar, no carb-laden flours, just low-carb pancake-y deliciousness. What’s even more surprising about this keto pancake recipe is that it also comes with some health benefits. For starters, one of the main ingredients in these pancakes is known as a superfood in many health circles. Is it a berry? A seed? A special powder? Nope. The superfood I am talking about is eggs. Eggs are a good source of ten essential vitamins and minerals and complete protein, and an even better source of choline, lutein, and zeaxanthin, which all play vital roles throughout the body. 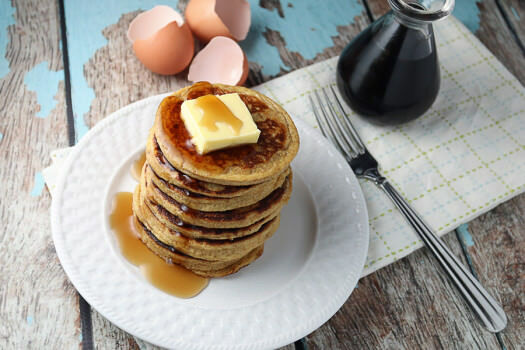 As the eggs are covering your micronutrient and antioxidant needs, the coconut flour that is used to make these pancakes will provide your gut with the fiber it needs to stay healthy. Without fiber, the gut microbiome tends to become dysregulated, which impairs gut health and the immune system. The fiber from the coconut flour will help feed the good gut bacteria so that they can help improve the integrity and health of the gut. To make your pancakes even healthier, consider adding some keto-friendly berries like blueberries on top — or you can try out the next keto pancake recipe on our list. There’s nothing like a delicious stack of fresh blueberry pancakes to start your day. And with this recipe, you’ll be able to whip them up in minutes. Instead of using milk — as you would in most pancake recipes — you’ll be using ricotta and vanilla almond milk. The combination of these two ingredients provide a richness to the pancakes that are balanced out perfectly by the almond flour and golden flaxseed meal. The ricotta is also packed with a fatty acid called conjugated linoleic acid, which may help with fat loss and lower the risk of many diseases. The golden flaxseed meal that you’ll be using also helps protect your body from many diseases because of its high lignan content. 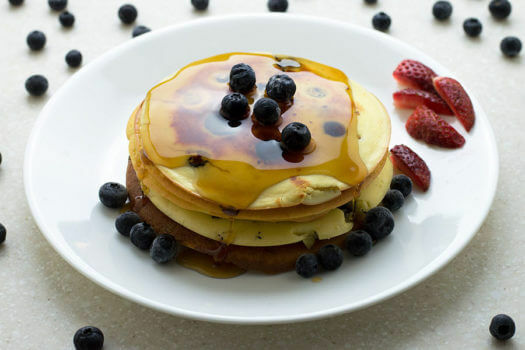 Furthermore, the feature ingredient in these low-carb pancakes, blueberries, contains a type of anthocyanin (a plant pigment) that is an active blood sugar lowering agent. Studies have also found that the flavonoids in blueberries (and other berries as well) provide us with cardiovascular benefits, cancer prevention, and cognitive improvement. Altogether, these keto pancakes take the flavor and health benefits of our first pancake recipe to the next level. These are not peanut butter pancakes — they are peanut pancakes. These pancakes are a keto version of Apam Balik, a very common style of peanut pancakes that are found throughout Malaysia and Singapore. Although these pancakes are commonly filled with sugary ingredients like condensed milk, creamed corn, and/or raisins, we decided to make a keto-fied version with keto-friendly “condensed milk” and peanut filling. My favorite part of this pancake recipe, of course, is the peanut filling. It’s crunchy and peanutty with the right amount of sweetness. I also like to include peanuts in my diet for the extra vitamin E, b vitamins, minerals, antioxidants, and fats that they provide. More specifically, the monounsaturated fatty acids found in peanuts lower LDL cholesterol and increase HDL cholesterol, which helps protect us from heart disease, while the antioxidants found in peanuts (e.g., p-coumaric acid and resveratrol) help prevent various types of cancer. So, feel free to indulge in these keto peanut pancakes next time you want something peanutty and delicious — your body will thank you. 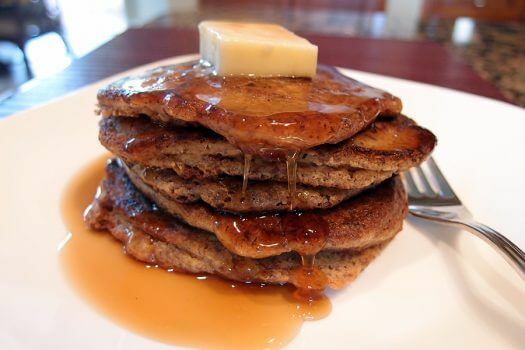 These are the peanut butter pancakes that you might have imagined when you read “Keto Peanut Pancakes” earlier. If you love peanut butter (and I think most of us on keto do), then you’ll definitely love these. 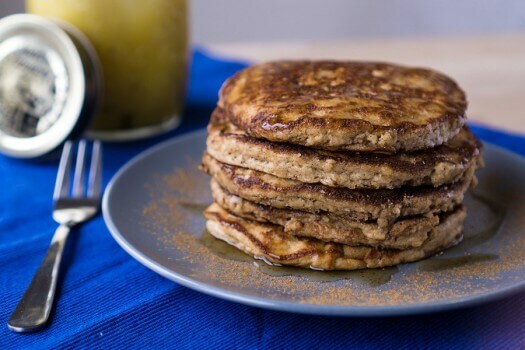 All you need is golden flaxseed meal, eggs, peanut butter, baking powder, butter, and keto-friendly maple syrup to make these addictively satisfying pancakes. You already know how excellent eggs, flaxseed meal, and peanut butter are for your health, but did you know that heavy cream and butter hold some health benefits as well? Some studies suggest that a moderate consumption of high-fat dairy like butter and heavy cream can reduce the risk of heart attack and stroke by improving the cholesterol levels (in many people). Butter and heavy cream are also packed with the fat-soluble vitamins A, E, and K2. Vitamin K2 is especially important because many of us get so little of it in our diets. It is essential for maintaining bone and heart health and preventing cancer. In other words, feel free to add an extra slab of butter on top of your low-carb peanut butter pancakes — it won’t clog your arteries or ruin your health. In fact, it may do just the opposite for you. These are another low-carb variation of the plain pancake, but many ketogenic dieters think that they are better than the original, white flour based pancake. How could these keto pancakes be better? Because they are a bit fluffy, a bit heavy, flavorful, and extremely filling. In fact, they will keep you fuller for much longer than any other pancake. The secret to how satiating these keto pancakes are can be found in the coconut oil and coconut milk that are used to make them. Both of these coconut products are packed with medium chain triglycerides (MCTs). In studies done on MCTs, the subjects tended to eat fewer calories and feel less hungry after eating a meal with MCT oil. This phenomenon is mostly due to the fact that MCTs skip the digestion pathway that most fats follow and go straight to the liver where they are converted to ketones for fuel. The ketones will then provide energy for ketone-burning cells like the brain and muscles. As a result, your body’s need to consume more calories for energy is significantly reduced. For this reason, this is my go-to pancake recipe if I want to cut down on my calories for the rest of the day and boost my ketone levels. The subtle sweetness and unique flavor of pumpkin and pumpkin pie spice fit perfectly into a pancake. You may even like these so much that they will become your primary keto pancake recipe regardless of what season it is. Pumpkin is also a great vegetable for keto dieters because such a small amount of it can meet your daily needs for vitamin A — a vitamin that is essential for skin, bone, eye health, and night vision. Pumpkin also provides us with many antioxidants and some fiber that are like a health insurance policy for our gut and overall health. In this recipe, you will also be using almond flour or almond meal. This low-carb flour is one of the most popular keto flours. It’s high in protein, fiber, and vitamin E, making it a healthy addition to the keto diet as well. For the sake of your health and your palate, don’t wait until autumn to try these low carb pumpkin pancakes. This is one keto pancake you don’t want to miss out on. 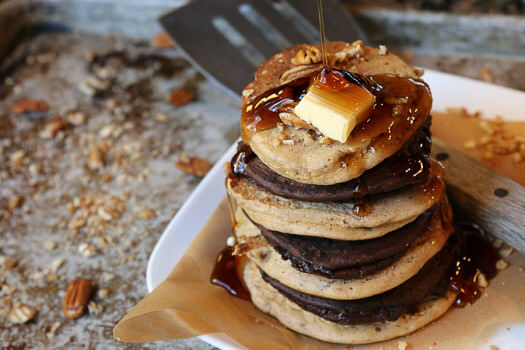 This low-carb pancake recipe is actually two keto pancakes in one — maple pecan and brownie batter chocolate chunk. The combination of maple and chocolate is so perfect that the extra effort this recipe will take is so worth it. 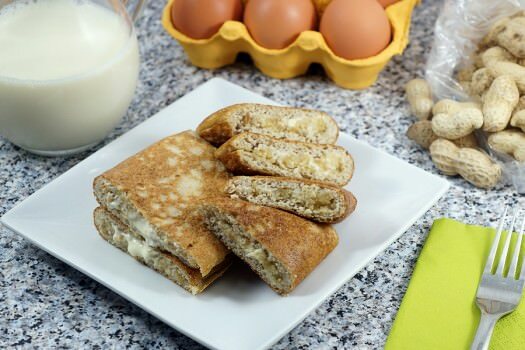 If you really want to treat yourself, then this keto pancake recipe is exactly what you are looking for. Plus, it contains many of the healthy ingredients found throughout this keto pancake recipe article. One of the main reasons why this pancake stack is so healthy is because it features dark chocolate and cocoa powder. These ingredients contain potent flavonoids that boost health in many ways. For example, once cocoa is consumed, its flavonoids work as prebiotics and improve digestive health. Some of these flavonoids will make it into the bloodstream where they help improve insulin sensitivity, lower blood pressure, and prevent plaque from building up in the arteries. Cocoa contains a unique combination of caffeine and theobromine as well. These two work together to protect brain function and improve mood without causing the sleep disturbances or other side effects that commonly result from caffeine consumption. 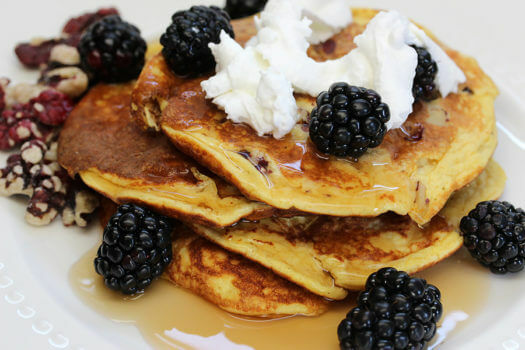 When you combine the benefits of cocoa with the healing properties of the ingredients in this recipe that we learned about earlier (e.g., almond flour, eggs, coconut milk, and coconut oil), you’ll get these low-carb pancakes — a stack of pancakes that will boost your mood, your energy, and your health. In other words, if you want to treat yourself and your health, then this low-carb pancake stack is for you. Everyone will have slightly different macronutrient needs on the ketogenic diet depending on their weight, activity levels, and goals. For this reason, you may find that these pancake recipes have too much of this and too little of that — so does this mean that you should give up on pancakes if that don’t meet your macronutrient needs? Not necessarily. Although adding ingredients to the batter will most likely ruin the consistency, you can still have other foods and condiments with the pancakes that can help you meet your macros. Melt a tablespoon of butter on top of your pancakes for extra fat. Make your own maple syrup with this recipe, and drizzle some on top of every pancake to add some more fat. Have the pancakes with a side of bacon (or any other high fat, zero sugar breakfast meat) for some extra fat and protein. Put some berries on top or in the prepared batter for some extra carbs, fiber, and health benefits. Yes, it is possible to make healthy pancakes that won’t throw your blood sugar, cholesterol, and overall health out of whack. All you need is the right combination of keto-friendly ingredients, and you will be able to make pancakes that are better than the original. Once you’ve got the hang of making low-carb pancakes, feel free to experiment and make your own creations. If you come up with anything that is keto-friendly and delicious, please let us know!